Year 11 marked arguably the finest season in Lehigh Valley IronPigs history. The Pigs finished 2018 with the best record in Triple-A baseball (84-56) and with their top winning percentage all-time (.600). They also qualified for the International League playoffs for the third-consecutive season and for the fourth time since the team's inception. Most importantly, the Pigs won their first-ever North Division championship - and by a whopping 10.0 games over the pack. However, for the third-straight year, they were knocked out of the postseason in the first round by their biggest and closest rival, the Scranton/Wilkes-Barre RailRiders. Regardless, the Pigs' 2018 season will be remembered for a long time for a myriad of reasons. As a whole, Lehigh Valley put forth a remarkable effort despite a franchise-record 235 transactions and 19 players promoted to Philadelphia. After an ordinary start (11-11 in April), the Pigs tied a franchise record by reeling off four-consecutive winning months. They finished the season with 84 victories for just the second time in franchise history and for the 10th time ever by a Phillies Triple-A affiliate dating back to 1940. The Pigs held first place in the North for 115 days during the season and for the final 90 days beginning with a walk-off, home win over Toledo on June 3. On July 22, the Pigs lead in the North swelled to a franchise-record, 7.5-games and later grew as large as 11.0 games with a 6-5 home victory over Syracuse on Aug. 5. In fact, that win put the franchise at 775-774 all-time - marking the first time the team soared above .500 overall in 1,549 games and 3,776 days since its inception in 2008. There were many memorable moments during the regular-season run. In the home opener against Louisville on April 12, Bethlehem native Matt McBride hit two home runs - including a grand slam - in his first game ever at Coca-Cola Park. From July 3-13, the Pigs played six-consecutive, extra-innings affairs at Coca-Cola Park - winning five, including four in a row from July 3-8. Then, there was the division clincher on Aug. 25 - when the Pigs walked-off with a 2-1 victory over the RailRiders on a two-out, game-winning single by SS J.P. Crawford. Additionally, Lehigh Valley led the IL in home runs (145) for the first time in team history -- fueled by a franchise-record seven players reaching double figures: 1B Joey Meneses (23), OF Dylan Cozens (21), 3B Mitch Walding (19), OF Danny Ortiz (15), INF Trevor Plouffe (12), OF Collin Cowgill (12) and McBride (10). Individually, the team racked up significant honors and accolades. 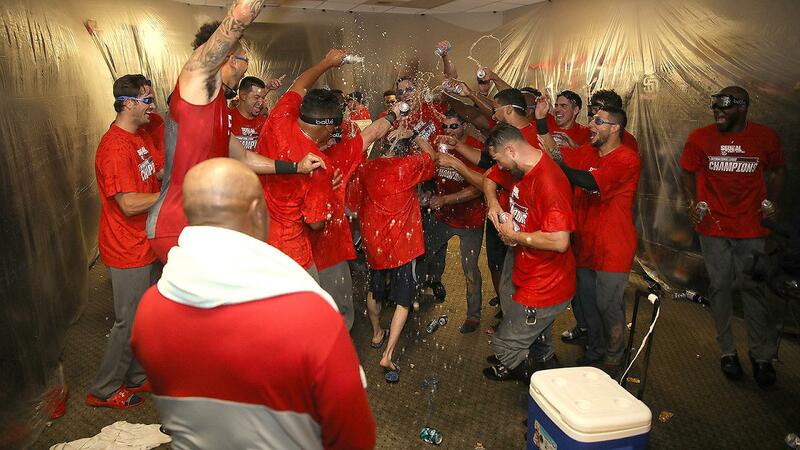 The Pigs became the first IL team in 23 years (since the 1995 Norfolk Tides) to sweep all the major awards. Meneses was named both IL Most Valuable Player and Rookie of the Year, LHP Cole Irvin was tabbed IL Pitcher of the Year and Gary Jones was hailed as IL Manager of the Year. Meneses became the second Pig in two seasons to earn both the MVP and the Rookie of the Year after Rhys Hoskins became the first LHV player to win either award in 2017. The 26-year-old led the IL in hits (153), slugging percentage (.510) and total bases (251) while finishing tied for first in HR, RBI (82) and runs scored (75), second in batting average (.311) and third in extra-base hits (51). The IL mid and postseason All-Star also set a franchise record with 45 multi-hit games. In addition, he became the first Lehigh Valley player all-time to win three weekly honors in one season and the first batter in the IL to do so since Fernando Seguignol (COL) in 2003. The former Braves prospect made a serious threat at becoming the IL's first Triple Crown winner since Hall-of-Famer Jim Rice accomplished the feat with Pawtucket in 1974. Irvin became the third Pig to earn Pitcher of the Year honors, joining Tyler Cloyd (2012) and Jake Thompson (2016). In his first season at the Triple-A level, the 24-year-old set a single-season franchise record with 14 victories -- the highest total by a Phillies' Triple-A farmhand since Joe Roa posted a 14-0 record in 2002 with the SWB Red Barons. He led the IL in wins (14; t2nd in MiLB), ERA (2.57) and WHIP (1.05) and ranked third in strikeouts (131). He also set a franchise record by winning seven-consecutive starts (May 7-June 10) and tied another by winning eight-straight decisions (April 27-June 10) -- a feat also only accomplished Cloyd and Thompson. Jones became the first Pigs skipper to win Manager of the Year after piloting Lehigh Valley to its first North Division championship in its 11-year history. This also marks the fifth time in his 16 seasons at the helm that Jones has been tabbed MOY, previously earning the honor in 1991 (Midwest, A), 1996 (Pacific Coast, AAA), 1994 (Southern, AA) and 1997 (PCL). In addition to the awards, the Pigs boasted a franchise-record and league-best four representatives on the IL postseason All-Star team in Pedro Beato (relief pitcher), Irvin (starting pitcher), Meneses (first base) and Walding (third base). Beato became the first Pigs player to garner multiple selections in a career. The 31-year-old led all of Minor League Baseball in saves (35) for a second-straight season -- a total that broke his own LHV single-season record set a season ago (33). He also led the IL in appearances (63) while recording a career-high eight victories. Walding joined Cody Asche (2013) as the only Pigs third basemen ever selected as an IL postseason All-Star. The 25-year-old led the IL in walks (73) while ranking third in on-base percentage (.390), fifth in slugging percentage (.474), sixth in home runs (19), seventh in runs scored (70) and eighth in RBI (69). In July, Walding was selected as IL Player of the Month -- joining just Andy Tracy (June 2010) and pitchers Phil Klein (August 2016) and Tom Eshelman (May 2017) as the only four Pigs players to earn this honor all time. There were other notable individual accomplishments. LHP Brandon Leibrandt started the season with an incredible 30.0 scoreless innings. Dating back to 2017, his scoreless streak totaled 32.2 IP - easily shattering the long-standing record of 27.0 IP set by Les Walrond in 2008. On May 2, Cozens became the first Pigs player ever to hit three home runs in game. On July 28, Walding set a franchise record for most home runs (4) and RBI (10) in a day during a doubleheader sweep against Columbus. From July 6 through Aug. 4, INF Dean Anna registered the IL's longest hitting streak of the season at 22 games -one shy of tying the club record (23) set by INF Scott Kingery in 2017. The season also featured the development of a number of Phillies prospects, as seven players went from Lehigh Valley to the majors for the first time in their career. The group was highlighted RHP Enyel De Los Santos (10-5, 2.63 in 22 GS), the top vote-getting pitcher for the IL midseason All-Star team. The 22-year-old sported a league-leading 1.89 ERA at the time he was first promoted to Philadelphia and won his MLB debut on July 10 at Citi Field. He finished the season ranked second in the IL in ERA, third in WHIP (1.16) and tied for fourth in wins. LHP Ranger Saurez (2-0, 2.74 in 9 GS) also won his MLB debut on July 26 at Cincinnati shortly after his first promotion to Triple-A on June 29. The Pigs finished 7-2 in games he started during the season. LHP Austin Davis (0-1, 2.95 in 24 G) and RHP Seranthony Dominguez (1-0, 0.00 in 3 G) were two other former Pigs who both made an immediate impact in the Phillies' bullpen. Although another run ended with the disappointment of falling short of a first IL Governors' Cup championship, Pigs' fans have been fortunate to witness the evolution of the organization. After never once soaring above .500 at any point during the first three seasons in club history (2008-10), Lehigh Valley is the only team in the minor leagues with at least 80 wins in each of the past three campaigns (2016-18). So perhaps Year 12 will mark the season when the team is finally able to Squeal the Deal… after all, 2019 is the Year of the Pig!